This is the second of three parts to the “Old Barn” poems. In the summer of 1974, I spent 3-months with grandma and grandpa Batcher at the farm on the plains of eastern Oklahoma, surrounded by fireweed and roses. I remember our second summer together, and the first road trip we wanted to plan. You desired Colorado and the mountain air surrounded by white-tipped peaks. I had another idea, and agreed to anywhere you liked as long as we visited Oklahoma for a day or two. There is something I want to show you – in the fields, on the outskirts of town, a farm where my grandparents migrated and where I grew up within the fields, the bluffs and the river. The faded red farmhouse resides west of Main Street on the right-had side of Batcher Road. Welcome home – grayed-white patchwork fence, the grain silo with silver dome slightly askew, and the mailbox carved from fallen poplar atop welded iron rings and railroad ties. Though the baked apple pie and old spice no longer permeate the summer air, the rusty red and white tricycle waits on the front porch, exactly where it was left. Deep ruts with overgrown grasses to either side demark the driveway. Flora long ago took over the prized gardens that fed the family and townspeople. Taken each week to the farmers market, grandpa heaved corn, tomatoes and cucumbers into the truck bed. The red 1949 Ford F1 with white sidewalls sagged in the rear. Grandpa spent more time reinforcing the suspension then he did growing the fruits and vegetables. I helped grandpa each morning load the previous days harvest into the back of the rusty Ford which took a bit of coaxing to get moving out of first gear. Grandpa had time, and I was happy just being with grandpa. It did not matter how long it took to leave the driveway. To the left of the farmhouse, near a small apple orchard, three weeping willow trees approach their full height. The veil of branches reaches down and touches the earth. Walking along the side of the house through knee-high grass, small rocks, and the burrowed tunnel openings, something in the distance reflects the sun. Somewhere in the wild grass, the hand pump connected to the well that grandpa dug and built, lies rusting. On the 18th of April, the swallows left the barnyard. Their empty nests tossed about – in the trees, the yard, within the gutters. The last breath sighed from the barn as the roof collapsed. Winter left behind decaying acorns, leaves and branches. A thousand feet or so west of the farmstead, the earth gains elevation. Rising closer to the sky and meeting the heavy clouds and the rolling cumulonimbus – the gray and black with tinges of pink as the afternoon sun plays. I take your hand and we walk the trail packed from years of hard labor, now covered in big bluestem. The bluff overlooks the creek flowing north to south through fields toward the waiting lake. To the northeast, a slight movement of black feathers catches the eye. A flock of ravens hold their pattern just above the wheat tops. In the far distance, perhaps 2 or 3 miles, the suns shadow retreats toward the tree line, over the top and back to the horizon. I remember the creaking barn doors – oak stained red and streaking from years of fending off straight-line winds and rain as storms made their way east across the plains. The wide path strewing hay, fence posts, barbed wire, windows, and an old John Deere. Walking along the back of the house, the barn comes into view – one I have not seen in seven years. The white trim faded and stained with grime. Along the perimeter, wild roses bloom with lucid colors against the dulled barn. Even from this distance the black iris is unmistakable. Their silk petals shimmer behind the swirling willow branches. A letter sent from the neighbor a mile down the road, who found grandpa, said he was under the willow tree where the black iris grows. Each winter since April 18th, 3 of them poke through the drifting snow. We decide to spend the evening in the farmhouse one last time before new owners receive the key and title next week. They may keep the farmstead as is or raze the house and build new – I have no care, except the barn. 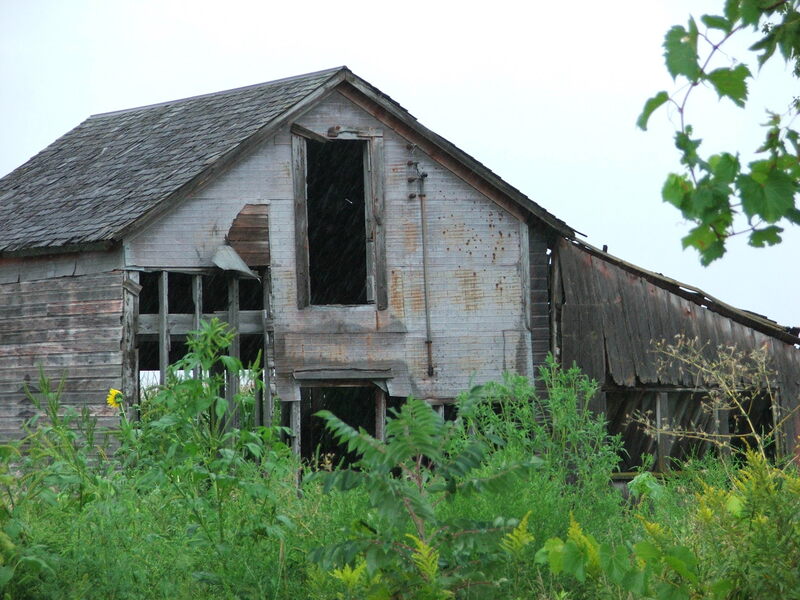 I pray the barn in its leaning and dilapidated state, but full of personal history, is spared. I hope they let the wild iris and willow trees grow and continue bringing peace and silence. In due time the elements and earth will take the barn on their terms, returning what we took by hand. Near midnight we are awakened by thunder and intense light though the bare windows. Sleep finally came after the storm moved east across the fields, into the distant plains. Nine years old and we run through tall summer grass swaying in the northern wind. Each tip reaches toward the ground. We run for hours chasing something long forgotten since the game began. Any one of us, including Leroy the black lab, could be “it”. Timmy is near the creek and a willow tree as his laughter gives away his guarded secret. Johnny is lying somewhere in the grass, muffled giggles that Leroy is desperately looking for. The howls, quick barks, and the tail straight as if the great hunter has found the treasured pheasant lurking amongst the Indian grass. We run chasing shouts of “you’re it” and “catch me if you can” until knees are numb and our breath can no longer be caught. Collapsing into clumps near the creek, smiles and laughter carry down the shore, along each bank, and into the changing leaves and branches. The summers on the barn will never be forgotten. No matter how things were going with mom and pops back home, the time with Grandpa loading the vegetables, chasing Leroy through the fields, fishing in the creek, stealing bits of the fresh apple pie, or just laying in the tall grass and imagining shapes within the clouds, became a part of me. This entry was posted in Arts, Poetry and tagged barn, childhood, family, farm, grandfather, homestead, john deere, longing, love, memories, river, summer. Bookmark the permalink. developed and influenced palace building in China for over a millennium. Thank you mom, I thought you would appreciate this one. I have a couple more pieces about grandpa that I will put on here.